It took them two years. That's not raccoon size. That's squirrel size. I have no idea what was in the can that prompted the intensive chewing to get to it. 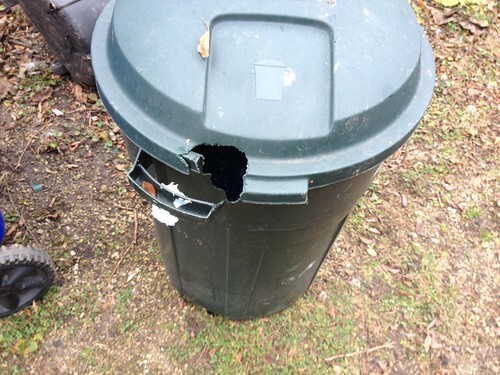 I've seen squirrels sitting on top of the can, but I did not think they liked to chew plastic. After all, they left the can alone for 2 whole years. The hole is right by the handle and, essentially, renders the handle useless. I'm not sure what kind of repair to make here. The rest of the can and the lid are fine so it's a waste to replace it for a new can and lid. Just dust tape it inside and out, once the weather gets above 45 degrees or so? Any other suggestions? Since doing this, they've left the can alone. I do encourage them to be in the yard by putting out peanuts on occasion. I just never expected this to happen.